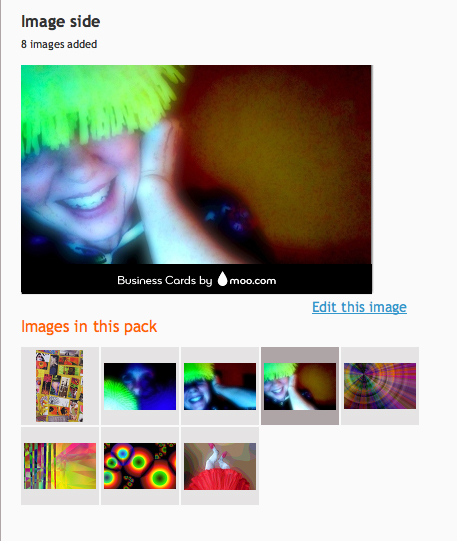 A screen shot of the images I uploaded to MOO for their free offer. Have I mentioned just how much I love Moo Mini-cards? Probably not on my blog. But I’ve done the appropriate amount of squealing,gushing,strutting,and effusing about them to friends,coworkers and strangers who take my cards. (And yes,when I first received them in the mail,there was a happy dance involved in the privacy of my kitchen). Anyway,I was on the Moo site today,and noticed they had an offer for ten free business cards,so I thought I’d give ’em a try before ordering a larger quantity. I uploaded eight of my own images,customized the flip side with contact details,and a little banner image across the top,hit the send button,and now twiddle my thumbs in anticipation of their arrival. Moo’s headquartered in London,but opened an additional shop on the East Coast a few months ago. This is great news for those of us State-side,b/c shipping time will be uber-quick. So here’s a little digital shout-out to Moo. They’re also on FB and have a great blog,–take a gander.